The people known as Nez Perce — a name bestowed by an interpreter with the 1805 Lewis and Clark expedition — call themselves Nimi’ipuu, which means “real people” or “we the people.” For thousands of years before the arrival of white settlers, the Wallowa band of Nez Perce made their home in the lush and rugged landscape of the Wallowa Valley, in Oregon’s far northeastern corner. In 1855, a U.S. treaty guaranteed the Nez Perce these lands, along with other sections in what is now Washington and Idaho. However, after gold was discovered throughout the territory in the early 1860s, the government proposed reducing the reservation land to one-tenth of its size, taking away nearly six million acres. While the majority of the chiefs — including Tuekakas, commonly known as Old Joseph — refused to approve the new treaty, a small group of chiefs based in Idaho agreed in 1863 to sign away the land and stay confined to the reservation there. Followers of Old Joseph and his son Heinmot Tookyalakekt — Chief Joseph — continued to stay in their ancestral land in the Wallowa Valley but faced increasing pressure to leave. In 1877, under threat of a cavalry attack, Joseph prepared to lead his people toward the Idaho reservation. But a small group of young Nez Perce warriors, angered over the loss of their homeland, raided a nearby settlement, killing some whites. The army immediately began to pursue the Wallowa band and other holdouts, forcing them on the run. After the surrender, Chief Joseph and his people, believing they would return to their home reservation, instead were ultimately sent to a reservation in what is now Oklahoma, where many died from epidemic diseases. Despite appearing before President Rutherford B. Hayes in 1879 to plead his case, Chief Joseph and his group were not allowed to return to their homeland until 1885. Even then, they went not to the Wallowas or to the reservation in Idaho, but to Colville, a non-Nez Perce reservation in Washington, where Chief Joseph died and was buried in 1904. Today the Nez Perce are scattered: many are on the Idaho reservation, where the tribal government is headquartered; others are governmentally part of the confederated tribes on the Colville reservation; some are on the Umatilla Reservation in Oregon, while still others are in Oklahoma or Canada. For more than century, the Nez Perce have been a diaspora population with no one place to call home. In the years following the Nez Perce’s exile from the Wallowa Valley, much of the area became private ranch land. In 1995, the Bonneville Power Administration — as part of a fish and wildlife mitigation project meant to compensate for the damage done by the agency’s many hydropower dams — agreed to a Nez Perce proposal for funds to acquire and manage a portion of land in the heart of their ancestral territory. One rancher, a conservationist who didn’t allow the land to be heavily grazed, offered to sell his 10,300-acre property, known as Chief Joseph Ranch — land where the Wallowa band once had their summer camp and, tribal elders say, Chief Joseph might have been born. Conservationists had been eyeing the land for some time, but it wasn’t until the tribe was involved that preservation became politically feasible. The nonprofit Trust for Public Land, a national land-trust conservancy, negotiated the terms and funding for the acquisition, which was completed in October 1996. 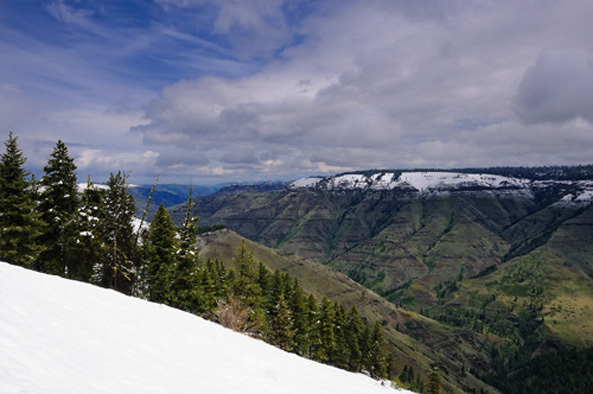 The Nez Perce, not the federal government, would manage the land as a wildlife preserve; no one would live on the land, though it would be open to the public and available for limited recreational use. Meanwhile, some white residents of Wallowa County and dispersed Nez Perce descendants had been discussing the return of a Nez Perce presence via an interpretive center and powwow grounds, which resulted in the establishment of the Wallowa Band Nez Perce Trail Interpretive Center Inc. in 1995. Community support for a symbolic return helped ease opposition to the land acquisition, which might otherwise have been unpopular because of the white community’s homesteading tradition and support for keeping land in private hands. Thus, on July 7, 1997 — 120 years since the tribe’s forced exile — the Nez Perce held a naming ceremony and salmon feast at a site overlooking Joseph Canyon to commemorate their reacquisition of the land they call Hetes’wits Wetes, or “precious land.” Elder Horace Axtell conducted the ceremony in a gentle rain, which another Nez Perce leader, Soy Redthunder, suggested was symbolic of the need to cleanse the land of its past violence. Subsequent acquisitions have increased the size of the restored homelands, collectively called the Precious Lands Wildlife Area, to 16,286 acres. The area serves as a sanctuary for bighorn sheep, elk, cougar, salmon and threatened steelhead trout. Streams and meadows are being restored to their natural state through the reintroduction of native species, the removal of domestic livestock and noxious week control. Bighorn sheep numbers are now increasing after having been decimated by diseases brought from commercial sheep ranching, and tribal biologists are helping restore the county’s watershed and salmon runs, which have seen a dramatic increase over the past decade. While no Nez Perce live on the land, the tribe has set up an office in the adjacent town of Joseph as a way of rejoining the community and working with local residents. Efforts are under way to purchase additional sections of tribal homeland to reach a final goal of 18,000 acres. Bowen Blair, who negotiated the Chief Joseph Ranch land acquisition for the Trust for Public Land, said the cause attracted support from around world: “It gained more international publicity than any other Trust for Public Land project and brought an outpouring of real care and interest.” Blair noted that, despite painful history, the Nez Perce were gracious about taking back their property and allowing it to be open to the general public. In the wake of the acquisition and a growing awareness of the need to heal past wounds, the school board of the local high school decided to drop the school’s use of the name “Savages” and the accompanying cartoonish Indian mascot. Many town residents, clinging to what they argued were their own traditions, resisted strongly, leading to a big community fight and an eventual compromise to eliminate the mascot but keep the name. Images of the caricature were removed from the school — even sandblasted from the floor of the basketball stadium. Eight years later, however, the student body voted to do away with the name as well, changing moniker and logo to the Outlaws. Angela Sondenaa and Shana Kozusko, Precious Lands Wildlife Area Draft Management Plan (Nez Perce Wildlife Program: 2002). Bonneville Power Administration and Nez Perce Tribe, Northeast Oregon Wildlife Mitigation Project: Final Environmental Assessment (August 1996). Bowen Blair, “A Legacy of Native Lands,” Land&People, May 15, 2010. Bowen Blair and Chuck Sams (Trust for Public Land), telephone interview, March 31, 2009. Elizabeth Manning, “After 120 years, the Nez Perce come home,” High Country News, July 7, 1997. “NE Oregon Wildlife Project (NPT) Precious Lands,” Northwest Power and Conservation Council, May 2009. Nez Perce Tribe, “Nez Perce History,” Nez Perce Tribe Web Site, accessed June 22, 2011. “Nez Perce Still Tied to Wallowa County,” Seattle Times, March 8, 2009. “Northeast Oregon Wildlife Mitigation Project: Precious Land,” Northwest Power and Conservation Council, accessed June 22, 2011. PBS, “Chief Joseph,” New Perspectives on the West, accessed June 22, 2011. Trust for Public Land, “Chief Joseph Ranch,” The Trust for Public Land, accessed June 22, 2011. “Wallowa Band Nez Perce History: Remembering the Past,” Wallowa Band Nez Perce Trail Interpretive Center, accessed June 22, 2011.